Filipino boxer Rey Loreto to face the Japanese fighter Koji Itagaki of Japan on April 24, 2016 at Marina Hop, Hiroshima, Hiroshima. The Filipino fighter has a record of 21W(13KO)-13L, he was a former IBO world flyweight champion and the former WBA International minimumweight champion. He is currently ranked no. 2 in the minimum weight division and trying to capitalize at the light Flyweight division. 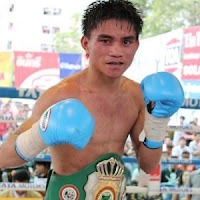 Loreto defeated Nkosinathi Joyi of South Africa on Feburary of 2014 to win the vacant International Boxing Organization World light flyweight title and on his last fight Loreto win the vacant WBA International minimumweight title against Fapikat Twin Gym of Thailand. On the otherhand, Koji Itagaki is a 32 years old Japanese fighter with the record of 16W(7KO)-9L. He won his last 4 fight via 2KO and 2 decision.